REVOLUTION TRAIN has the ambitions and potential of long-term effectiveness both in areas of drug prevention and promotion of healthy lifestyle. The drug prevention train shifts drug prevention from talks and other non-effective methods to a format that can make an impression on the 21st century public. 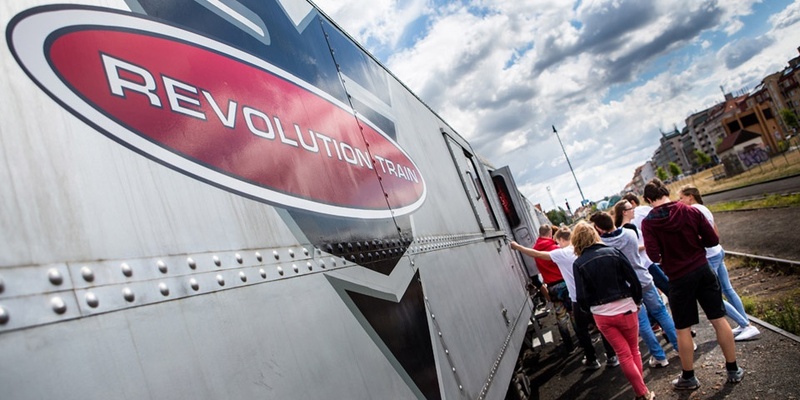 Connect your company name with REVOLUTION TRAIN. An authentic experience which engages all the senses and teaches useful lessons. To put it shortly: a well-spent day in an inspiring environment suitable for all those who have grown tired of traditional team-building activities. Use the unique premises of the drug prevention train Revolution Train for a non-traditional company team-building. You will get a tailor-made programme aimed at a healthy, confident and responsible lifestyle. Would you like an unconventional experience for your colleagues which engages all the senses (an international patented 5D technology), and combines useful lessons with a well-spent day in an inspiring setting? Contact the Revolution Train team. Going through the company programme in the drug prevention train will be beneficial to you in two ways: you will get employees that will be able to deal with emergencies, and at the same time you will support an innovative and socially beneficial programme by becoming its partner. Nadační fond Nové Česko invests its profits from the programme for companies into the development and improvement of further projects targeted at the education of children and youth. Cooperation with a project of this kind is a perfect example of CSR — corporate social responsibility. Therefore, you can perceive your visit as a display of your responsible role towards the public.